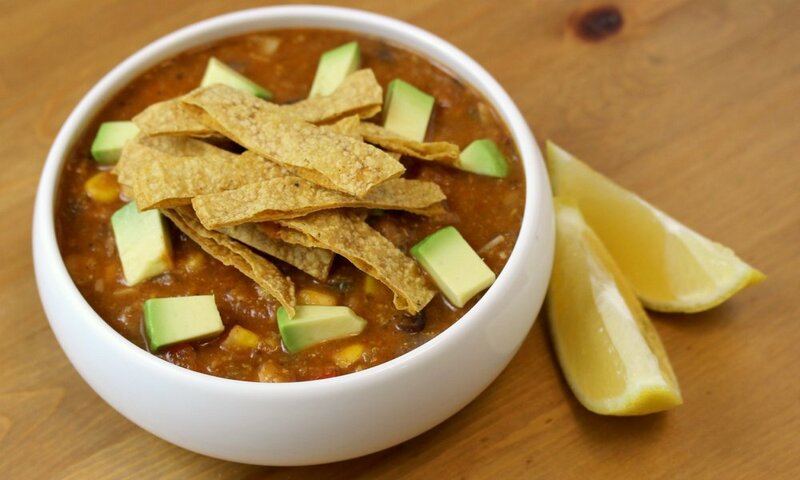 This tortilla soup makes the perfect easy weeknight dinner! It's budget-friendly, healthy, and can be ready in about 45 minutes. Alternatively, you can throw all the ingredients into a stockpot at the start of the day and walk away! What makes this recipe special? Stewed and shredded jackfruit has a similar texture to the pulled chicken that I used to always add to my homemade tortilla soups. You can find jackfruit at Asian markets or at many Trader Joe's stores nowadays. Make sure you buy young green jackfruit in water or brine. If you're not a fan of jackfruit or can't find it near you, feel free to sub in vegan chick'n strips (Beyond Meat make my favorite), or add an extra can of beans. I sauté all the ingredients in water rather than oil, and make my own baked tortilla strips. These simple touches lighten the dish up but don't compromise the flavor at all. Preheat oven to 350°F. Slice corn tortillas into strips and spread out on a lined baking tray. Bake for 18-20 minutes, until crispy. Remove from oven and set aside to cool. Boil jackfruit in water for about 15 minutes. Drain and allow to cool slightly before roughly chopping or shredding to resemble shredded chicken. In the meantime, sauté onion, garlic and peppers in water or oil until fragrant. Add corn, beans, tomatoes, broth and spices and bring to a boil. Reduce heat to low and simmer for 15 minutes. Add shredded jackfruit to soup. Optionally, remove 2-3 cups of the soup and puree until smooth, then return it to the rest of the soup to make it creamier. Serve with crispy tortilla strips on top. Avocado and a squeeze of lemon also go well with this soup. To make in a slow cooker, simply add all ingredients and cook on low for 7-8 hours or on high for 3-4 hours. It is recommended to coarsely chop the jackfruit first.